Can you help me identify this loom? I bought this loom six years ago from someone who bought it at a garage sale. She added the springs on the top of the castle, and she added (replaced?) a couple of treadles. It came with a remarkably corroded reed with two dents per centimeter, which works out to slightly more than 5 dpi. It's 54" wide and 64" high with space for four harnesses and six treadles; there's no evidence for lams anywhere on the frame, and it's presently rigged for a sinking-shed, direct tie-up. It is apparently made of maple or birch and is very solid, with steel beams; the supports for the beater are also steel. It has single ratchet pawls and aprons that appear to be coarse hemp or linen. When not in use it folds up very neatly to a remarkable 9" thick. I've woven about 30 yards' worth of fabric on this loom over the years, but I'm still not sure I've got it rigged correctly. 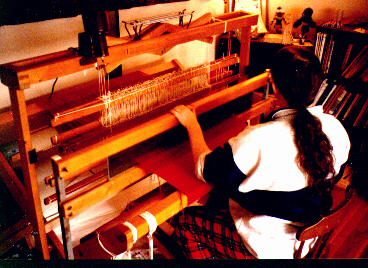 Here's a photo of the loom in use. 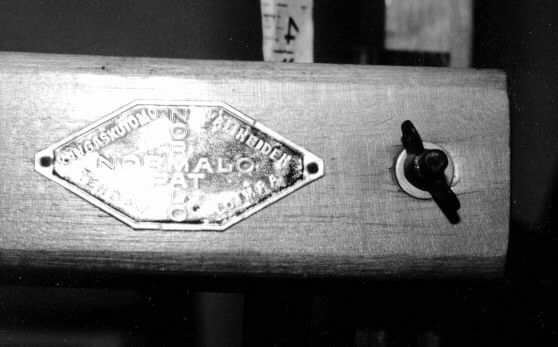 It also has the following metal label on the right side of the batten. As nearly as I can guess, the loom is Finnish (Tehdas seems to be a Finnish surname, and "loimaa" seems to be Finnish too), but that's all I know for sure. Based on its solidity, I'm also guessing it was a rug loom. As it's presently rigged, it falls into Allen Fannin's category of least common looms, those with a spring-action return. What I'd really like to know are the following. Is it supposed to be rigged the way I have it, or is it really supposed to be some kind of countermarche? How old is it likely to be? Does the company still exist? Does it still make these looms? If you have any information that can help me, I'd be extremely grateful if you'd please e-mail me at the address below. This page was created on 30 January 1999 and last updated on 12 April 1999.